When Silla and Nori arrive at their aunt’s home, it’s immediately clear that the manor is cursed. The endless creaking of the house at night and the eerie stillness of the woods surrounding them would be enough of a sign, but there are secrets too—questions that Silla can’t ignore: Why does it seem that, ever since they arrived, the trees have been creeping closer? Who is the beautiful boy who’s appeared from the woods? And who is the tall man with no eyes who Nori plays with in the basement at night… a man no one else can see? It has been quite awhile since a book let me down quite as much as And the Trees Crept In. In fact, this book has caused me to break a long-standing tradition of not rating books I don't finish. Having completed 70% of this never ending audiobook (and reading spoilers for the rest), I feel that I know enough to confidently rate this one disappointing star. 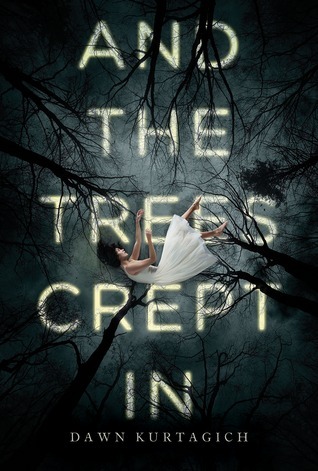 And the Trees Crept in is a horror story that follows Silla and Nori to they're aunt's house in the woods. Silla has led them there seeking shelter from their abusive father and an impending war(?). The house is immediately creepy - blood red and creaky - but Silla and Nori enjoy their time there at first. They get to know their aunt and spend their days gardening and reading in the library. Let me go ahead and say that none of these characters are likable. Silla grated on my nerves with her annoying, repetitive internal dialogue. Nori wasn't awful, but I just didn't find myself caring too much about her, maybe because Silla didn't and it was told from her perspective? And Crazy Aunt Cath was literally the worst, leaving her nieces all alone in her creepy manor. The only redeeming character in this entire book was the (sort of?) romantic interest, but he's not there enough to save it. Back to the story, things take a turn for the worse when Silla and Nori go against their aunt's rules by going near the woods. This is when the story really started to get weird (and slow). I really, really thought that this book was going to be terrifying. There were moments in the audiobook when there was background whispering, which was really unsettling at first. Then everything started dragging and the rules started getting muddled (can you go into the woods or not??). The trees are creeping closer, but at the point where they completely cover the house, the book is only halfway over! I couldn't believe it when I realized there was so much more to go. It could've ended with a bang there and I would've been happy, so why did this book continue to drag for hours longer? As much as I wanted to keep reading to find out what happened, I just couldn't force myself to keep reading. I spoiled the ending for myself, although I won't do it in my review, but suffice it to say, it was ridiculous. There was no reason for this book to go on for so, so long. It could've just been what it started as - a horror book with Slenderman and some creepy, creeping trees - but instead the author chose to flesh it out as much as humanly possible and then some. Was the setting creepy? Yes, absolutely! I was completely entranced by the moving trees and the creepy town beyond them. There were things that the author did right, for sure. The atmosphere is definitely one of those things. I just don't understand why she took it in this direction. I wanted to love this book SO MUCH! If you want to read a slightly creepy, pretentious book that tries to do more than it ever could have needed to, this is is the book for you! But if you're looking for a horror story that will haunt your nightmares, this is not the one.